Increase public awareness of Melanoma with our Melanoma Awareness Shirt. This Melanoma Awareness Long Sleeve Shirt supports people living with this condition and shows those around you how important skin protection is in our everyday lives. Help spread awareness for skin cancer by walking proudly with your support team wearing your Personalized Awareness Shirt. Our Personalized Melanoma Awareness shirt is available on our premium 100% cotton long sleeve shirt, machine washable in youth sizes S-L and adult sizes S-2XL. Includes FREE Personalization! 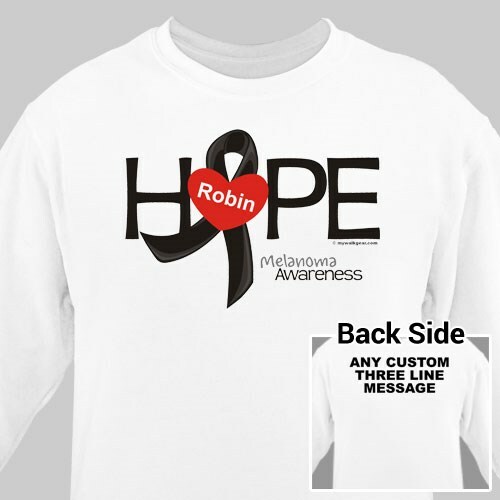 Personalized your Melanoma Awareness Shirt with any name on the front and any three line custom message on the back. Additional Info Because our skin is the largest organ in the body, it is important to be aware of Melanoma Cancer. Melanoma is the most common of all cancers and is the most serious form of skin cancer. In an effort to increase public awareness, MyWalkGear.com has created a large selection of Awareness Apparel and Gear to help show support for those suffering with this condition and to let everyone know how important early detection is. This Personalized Melanoma Skin Cancer Awareness Shirt is also available on our unique Melanoma Awareness Sweatshirt and our Melanoma Awareness Tote Bag.